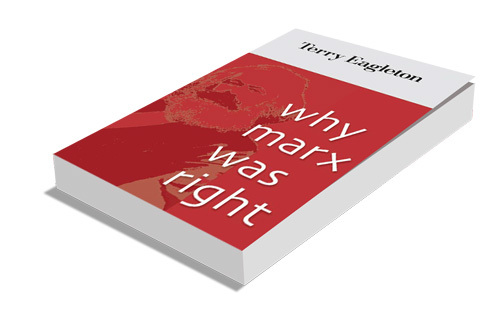 Eagleton, T. (2011) Why Marx Was Right. New Haven: Yale University Press. I have been reading the above book and would highly recommend it to anyone who will read it. It is worth a read I have extracted the following from the book and think they are rather important in relation to how our society functions and for the future shape that we want our to gain. Page 68: If you want to see what men and woman really believe, look at what they do, not what they say. Page 69: if it is to be more than an ideal fantasy, a radically different future must not only be desirable but feasible; and to be feasible, it has to be anchored in the realities of the present. It cannot just be dropped into the present and some political outer space. There must be a way of scanning or X-raying the present which shows up a certain future as a potential within it. Otherwise, you will simply succeed in making people desire fruitlessly; and the Freud, desire frugally as to fall ill of neurosis. Page 70: Starting from where we are may not sound the best recipe from political transformation. The present seems more an obstacle to such change then an occasion for it. Page 77: Marxists are hardheaded types who are sceptical of high-minded moralism and wary of idealism. With the naturally suspicious minds, they tend to look for the material interests which look behind heady political rhetoric. They are alert to the humdrum, often ignoble forces which underlie pious talk and sentimental visions. Yet this is because they want free men and women from those forces, in the belief that they are capable of better things. As such, they combine their hard headedness with faith in humanity. Materialism is to down-to-earth to be gulled by hand-on-that rhetoric, but too hopeful that things could prove to be cynical. There have been worse combinations in the history of humanity. Page 130: In a boldly innovative move, Marx rejected the passive human subject of middle-class materialism and put in its place an active one. All philosophy had to start from the premise that whatever else they were, men and women were first of all agents. They were creatures who transformed themselves in the act of transforming the material surroundings. They were not the pawns of History or Matter or Spirit but active, self-determining beings who were capable of making their own history and this means that Marxist version of materialism is a democratic one, in contrast to the intellectual elitism of the Enlightenment. Only through the collective practical activity of the majority of people can the ideas which govern our lives be really changed. And this is because these ideas are deeply embedded in our actual behaviour. Page 144: “it is social being,” Marx writes in The German Ideology, “which determines consciousness.” Or as Ludwig Wittgenstein put the point in his work On Certainty: “it is what we do which lies at the bottom of our language games.” This has important political consequences. It means, for example, that if we want to change the way we think and feel radically enough, we have to change what we do. Education or a change of heart are not enough. A social being sets a limit to our thought. And we could only break beyond these limits by changing that social being-which is to say, our material form of life. We could not get beyond the limits of our thought simply by taking thought. Page 170 and 171: Marx himself did not consider that you had to engage in manual labour to count as working class. In Capital, for example, he ranks commercial workers on the same level as industrial ones, and refuses to identify the proletariat solely with so-called productive workers, and the scent of those who directly turnout commodities. Rather, the working class includes all those who are forced to sell their labour power to capital, who languish under its oppressive disciplines and have little or no control over their conditions of labour. Negatively speaking, we might describe them as those who would benefit most from the fall of capitalism. In this sense, lower-level white-collar workers, who are often unskilled, with poor wages, job insecurity and little say in the labour process are to be counted among its ranks. There is a white-collar working class as well as an industrial one, which includes a great many technical, clerical and administrative workers bereft of any autonomy or authority. Class, we should recall is a matter not just of abstract legal ownership, but the capacity to deploy one’s power over others to one’s own advantage. Among those eager to put side over the funeral rites of the working class, much is being made of the immense growth in the services, information and communications sectors. The transition from industrial to “late,” “consumerist,” “post-industrial” or “post-modern” capitalism has indeed involve some notable changes, as we’ve seen earlier. But we have also seen that none of this is altered the fundamental nature of capitalist property relations. On the contrary, such changes have mostly been in the interest of expanding and consolidating them. It is also worth recalling the work in the service sector can be just as heavy, dirty and disagreeable as traditional industrial labour. …..